Climate change and gender: Part 1- Why should we care? [:en]Environmental researchers have warned for years now that the destabilizing effects of global warming will inflict far more suffering on women than men. As climate change slowly kicks in, these warnings are becoming a sad reality. Unfortunately for women, climate change has become the next (very big) hurdle on the path to equality. Why are women so vulnerable to climate change? To answer this question, it is useful to think for a minute about what vulnerability actually means. When digging through the definitions, three key words keep reappearing: exposure, sensitivity and adaptive capacity. Which makes sense, as the vulnerability of a human being (or earth system for that matter) very much depends on whether she/he is exposed to climate change, whether she/he is sensitive to it and whether she/he can adapt. From a women’s perspective, exposure is arguably not the biggest problem. Since exposure depends on location, there is little discrimination as to whom might be affected by climate events in one particular place. If the Maldives get engulfed by the ocean, both men and women will have to leave. Where it becomes more problematic, however, is when we think about vulnerability in terms of sensitivity. While men and women from a same location are exposed to the same climate events, a drought, a flood, a storm, their experiences might be radically different. These differences are often due to the gendered nature of economic or daily activities. In many countries women are, for instance, traditionally responsible for fetching water, a task that can become very arduous when droughts hit. With much drier climate in some parts of the globe, experts expect that women and girls will have to travel larger distances to fetch water which in turn might lead to greater absence from school, concerns for safety when further away from home and so forth. 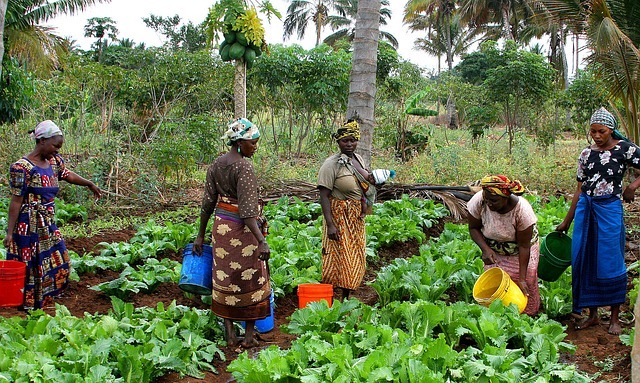 In the past decades, women have also become more and more involved in agriculture to the point where women form the majority of the workforce in the primary sector in some parts of the globe, a phenomenon that has been termed “the feminization of agriculture”. Given that global warming impacts the agricultural sector most heavily, this is worrying from a female perspective. By far the most important factor in women’s vulnerability to climate change, however, is adaptive capacity. Indeed, whether one can adapt to a changing environment largely depends on the resources available to the individual, be it financial, educational or social. Financial resources might enable climate victims to migrate. Educational resources might allow an individual to change activity sector or diversify his livelihood. Social resources, like networks, might give an individual access to crucial information on how to cope with a changing climate (disaster-preparedness, new agricultural techniques,etc.) or might give him the means to organize politically and make his voice heard. Unfortunately, across the world, women lack resources, in all their forms. Women consistently earn less, save less and have less access to credit than men, a situation that is largely caused by the still very gendered division of labour and family responsibilities. Women traditionally remain the main care-takers in families, limiting their potential to earn (higher) incomes and save money, which in turn also limits their access to credit. Gendered social norms also ensure women benefit from fewer years of education in many parts of the globe, and are unheard or underrepresented at all levels of decision-making, from the household to the international negotiation table. The impact? Women’s adaptive capacity and ability to cope with disasters is seriously hampered. There are by now a few (but still too few) studies that have looked at the gendered impacts of disasters and climate change. One of particular interest, by two social scientists, Neumayer and Plümper, analyzed how life expectancy of men and women were affected by natural disasters in the 80s and 90s. Their findings show a large gender gap; life expectancy of women decreases relative to men, suggesting greater death rates of women in times of disasters. Other studies have suggested that girls are less likely to survive during periods of drought, that climate events reduce schooling of girls, lead to earlier marriages and to women and girls having to take up more precarious employment. Climate change is bad news for many women and girls. Climate Change and Gender: Part 2 – What do women in STEM have to do with climate change?